Chelsea are feeling the heat. After opening the season unbeaten in their first 12 games, they’ve won just five and lost three of their next 10. A large reason for those struggles has been a lack of contribution from strikers, Alvaro Morata and Olivier Giroud, who have combined to score just six goals this season. Chelsea moved to rectify that situation. The club is about to announce the signing of Argentinian striker Gonzalo Higuain to a loan for the second half of the season. Shortly after, it was reported that a deal to send Morata to Atletico Madrid was nearly complete. Given Chelsea’s current situation, it’s a very curious move as it raises not only the question of whether or not Chelsea makes themselves better, but if they’re making things even worse for themselves in the long-term? Let’s get this out of the way, Higuain is a proven goalscorer. He scored 121 goals over seven seasons at Real Madrid, 91 goals in three years at Napoli, and 55 goals in two years at Juventus. He’s also 31 and as he’s gotten older, his numbers have naturally declined. Shot and goal stats for Gonzalo Higuain. He's still *good* and he has been an excellent finisher for his career. But you can see the normal aging trajectory. Higuain is far from a guarantee at Stamford Bridge. He’s scored just six goals in Serie A this year, and only one since Halloween. Higuain also has no Premier League experience and will need to adjust. To make matters worse, the list of strikers to successfully move from Serie A to the Premier League is not necessarily a long one. Take a look at this list from 90 MIN of players who moved from Serie A and had a big impact on the Premier League. How many of them are natural strikers? More importantly, eight of those nine transfers happened over 18 years ago! 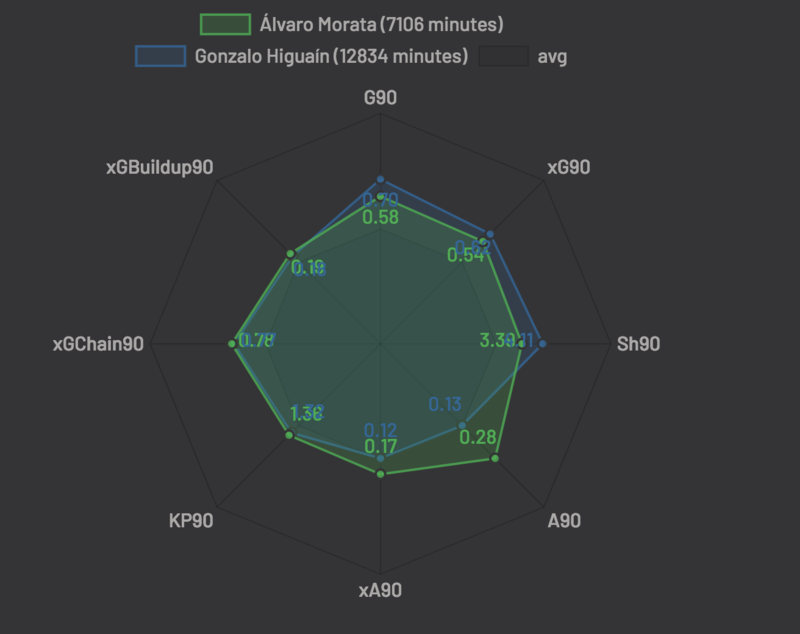 The five-year difference in age between Morata and Higuain isn’t important due to the short-term nature of the loan. What is important is the long-term predicament it leaves the club. 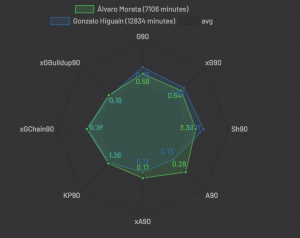 Statistically speaking, Morata and Higuain have put out very similar numbers over the past five years. The primary idea behind stats basically attributes to the phrase that players will play to the back of their baseball cards. Overall, things tend to even out; if a player goes through a goal drought in the first half of the season, it’ll probably even itself out over the second half. I’ll be the first to admit that stats don’t take the human element into account. If a player like Morata has lost all of his confidence, which it’s safe to say he has, he’s not likely to suddenly re-find himself without a change of some sorts. The change of manager didn’t help, now it’s time for a change of scenery. That doesn’t change the fact that if you’re a Chelsea fan, the question on your mind should be, why Higuain? Even Thierry Henry needed a season to adapt to the Premier League from Serie A, surely Higuain will need some time too. Therefore how much of an impact will he really have this season? The move reeks of a club trying to find a way to salvage a season but Chelsea’s season doesn’t need salvaging. Despite the lack of scoring, the club is still firmly in line to qualify for the Champions League. They’re in fourth place, six points clear of fifth. While it may not be the best way to use Eden Hazard, Chelsea have played several games with him as a false nine, leaving both their strikers on the bench to great results. Like stats, the Premier League table doesn’t tell the whole story. Chelsea knows the tide has turned on their season. They’ve slipped a bit and also have to worry about a very resurgent Manchester United team. But they also know that they’re just one point behind Spurs, who just lost Harry Kane and could slip even further in the table. The biggest problem with this signing is it doesn’t lead to a lot of belief in Maurizio Sarri’s ability to plan for the future. Next summer, Chelsea will be in a very interesting position. They won’t have a top striker, Eden Hazard is probably going to leave, and wingers Pedro and Willian will both be on the wrong side of 30. They’re going to need a nearly complete rebuild at a time where they may be under a potential transfer ban. They’ve already gotten started on this process by signing Christian Pulisic, but come next August will still have no Premier League experience and youngster Callum Hudson-Odoi won’t have much. There’s still going to be a learning process from those two. If that’s the case, just start the process now. 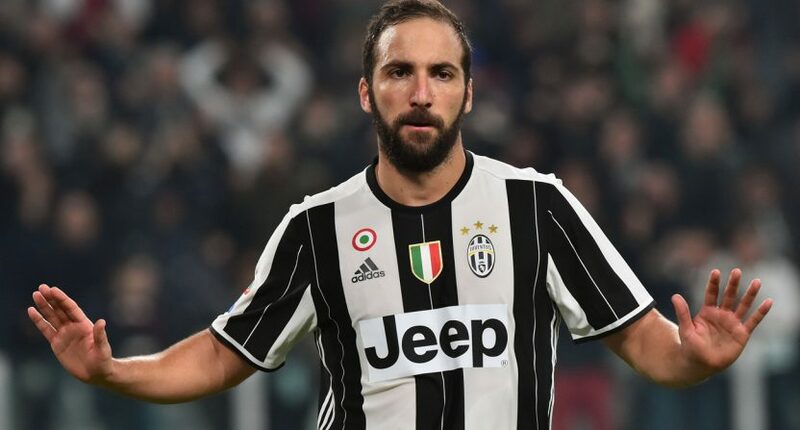 Instead of spending your money on Higuain’s wages, why not sign a younger, cheaper striker and let him spend the second half of the season adapting to the Premier League. Production wise, he can’t be much worse than what Morata and Giroud were giving you, but his experience over the next five months could make him ready for next season. While Chelsea will never do this because they are more valuable playing elsewhere while on loan, Chelsea have young strikers already under contract. Michy Batshuayi is having a disaster loan spell at Valencia, but he scored seven goals in 10 Bundesliga games with Dortmund last year. It’s also fair to say he never got a fair shot with Chelsea. You’re probably not sold on Batshuayi, who is already 25, and that’s fine. I don’t think he’s the guy either, but Chelsea also have 21-year-old Tammy Abraham who is tearing up the Championship with 16 goals in 21 games for Aston Villa. Abraham has essentially outgrown the Championship. He’s clearly ready for the Premier League but is he good enough to be the guy Chelsea relies on? That’s a different question but at 21, that’s a question that Chelsea need to find out the answer to sooner rather than later. Wouldn’t right now be the best time to do so? What if instead of signing Higuain they recalled Abraham from loan and rotated him with Morata and Giroud? Best case scenario, Abraham continues his great form and Chelsea have a homegrown striker for the future. Worst case, they’re getting the same production from their strikers, which isn’t great, but also hasn’t been a detriment to their season. Instead, Chelsea have chosen not to answer any of those questions. They’ve sold out on a short-term solution that doesn’t make them objectively better. What it will do is create even more questions that will need to be answered long-term. Is a half season of Gonzalo Higuain really worth it?